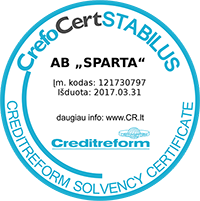 Sparta is the first company in Lithuania which started using a special technology for attaching labels. Labels are put on with one stitch, so it is extremely easy to take them off. You don’t need any scissors or other sharp instruments. The sewing thread doesn’t damage the sock, it is easily pulled out and leaves no traces.